Every lawyer was once a law student looking for a job. And every Law School alumnus remembers the squall of the search: the frenzied bustle of On-Campus Interviewing, the harried tangle of fellowship applications and government hiring deadlines, the frantic dash to snag a last-minute flight for a clerkship interview. That much hasn’t changed. Law School students in 2016 face a familiar array of pressures and puzzles—and yet the options they have and the support they receive have expanded in myriad ways, an evolution that has kept pace with a changing—and sometimes tumultuous—legal market. Today, the Law School’s Office of Career Services keeps a constant finger on the proverbial pulse, responding to the needs of its students as well as national patterns in legal hiring. When entry-level judicial clerkships dipped, Career Services staff and a faculty committee led by Senior Lecturer Dennis Hutchinson expanded the efforts to help students navigate the highly individualized clerkship process. When market failures made it harder than ever for students to afford public interest careers, the Law School bridged the gap with scholarships and fellowships. And when BigLaw hiring slowed, Career Services seized an opportunity to work one-on-one with students to suss out what they really wanted in a career—an approach that had actually begun several years earlier when Associate Dean for Career Services Abbie Willard joined the Law School. 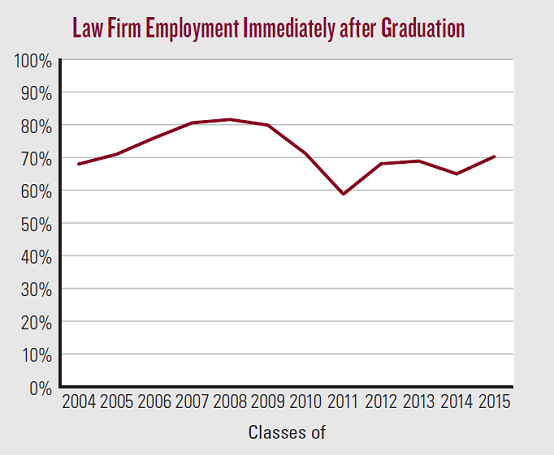 As a result—and because Law School alumni have always done well—overall employment rates right out of the Law School have averaged 98 percent since 2009. It’s a success Willard chalks up to three factors. And at the Law School, that has meant taking a tailored approach in each area of employment. Several years ago, entry-level clerkship numbers fell when federal judges, frustrated with a Federal Law Clerk Hiring Plan that had gradually eroded, began hiring alumni who weren’t regulated by the plan. 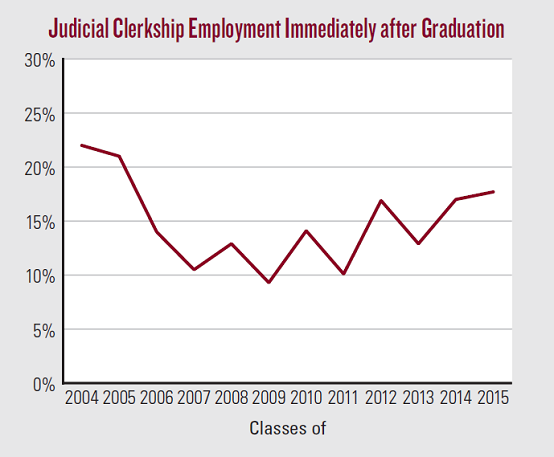 The drop was noticeable: in 2004, nearly one-quarter of Law School students entered judicial clerkships after graduation, but by 2007, that number had fallen by more than half. In some ways, it wasn’t surprising. The Hiring Plan, a nonbinding set of guidelines issued by the Administrative Office of the US Courts, had been deteriorating for years. The goal had been to standardize the hiring process, but that meant that judges couldn’t conduct interviews or make offers until a student’s third year. Judges began opting out, hiring students “off-plan”—interviewing on their own timetable and snapping up top candidates ahead of the Hiring Plan schedule. The process was rife with chaos: there were stories of panic, pressure, and missed opportunities. Alumni offered an attractive alternative: there was no pressure to adhere to the schedule since the plan applied only to students, and the more experienced candidates had the skills and perspective that come with being out in the workforce. 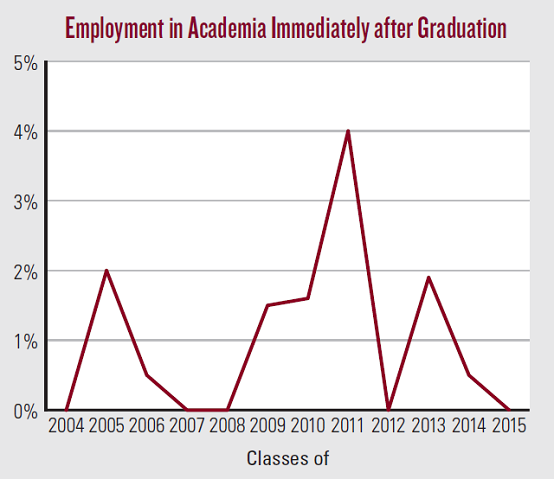 When the economic downturn came, the number of graduates applying for clerkships rose—and judges, having learned that they liked hiring alumni clerks, extended fewer offers to students. This was great news for Law School’s alumni—whom Career Services also supports—but frustrating for the students who were actively pursuing clerkships and needed help navigating the plan. So Career Services and the faculty clerkship committee formalized the system for helping students navigate the application process and devoted more resources to ensuring that aspiring clerks had the individualized support they needed. The faculty committee, which is chaired by Hutchinson and already included Lior Strahilevitz, the Sidley Austin Professor of Law, and Jonathan Masur, the John P. Wilson Professor of Law, expanded to include three new assistant professors: Daniel Hemel, Genevieve Lakier, and John Rappaport. In January 2014, the Administrative Office of the US Courts announced that it was discontinuing the Hiring Plan in favor of a more flexible system, a decision preceded a year before by the DC Circuit’s declaration that it would no longer follow the plan, which it said was “no longer fair and equitable to either students or judges.” However, by then, the Law School’s entry-level clerkship numbers had already begun to rebound. They rose from the recent low of 9.3 percent in 2009 to 17 percent in 2014. 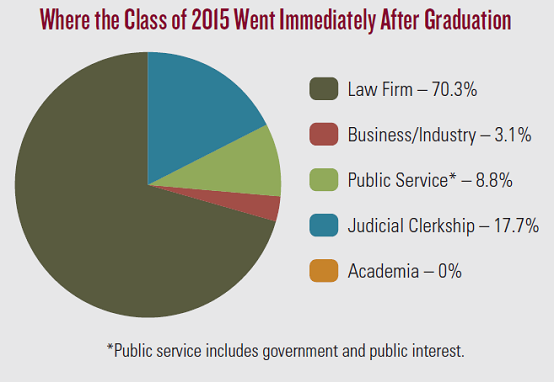 In 2015, 17.7 percent of graduates went directly to clerkships. Now, under the new system, judges are able to set their own guidelines and schedules, though students can’t access the Online System for Clerkship Application and Review (OSCAR) until the July after their first year. 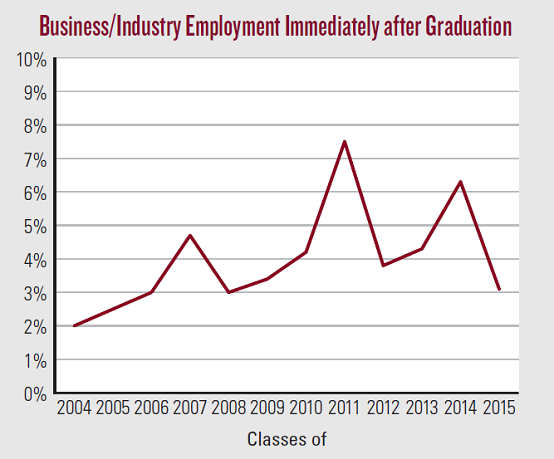 Alumni hiring has remained strong, and Willard expects that will continue. But she and others were glad to see the entry-level numbers on the upswing. Clerkships, after all, can prepare lawyers for a variety of careers—in academia, public service, law firms, corporations, and of course, as judges themselves. For instance, in the Law School class of 1985, 34 students entered clerkships. Among the 27 who have reported their current jobs to the University of Chicago, 13 work at law firms, 6 work in business, 5 work in academia, 2 work for the federal government, and 1 is a state appellate judge. Although law firms have experienced significant changes in recent years through mergers, acquisitions, closings, spinoffs, and layoffs, they still represent the most popular path for Law School graduates. But it is less common than it used to be. In 2011, the percentage of students who went to law firms after graduation fell to 58.8 percent—a drop from the roughly 81 percent who went to law firms in 2007 and 2008. But that drop was offset by students who chose other legal careers; the class of 2011 saw increases in the percentage of students who took jobs in public interest, government, business, and academia. The next year, law firm placement was back up at 68.1 percent, and has risen only slightly since then—a result, perhaps, of the Law School’s increased focus on self-awareness and finding the “right fit.” In the past decade, Career Services has focused on law student and lawyer satisfaction—looking for trends that might offer insight in predicting which areas of legal practice are best suited to each student. For many students law firm work was the right fit—but for others it was public service, a clerkship, corporate work, or academia. And for those who sought law firm work, there were additional variables to weigh, even beyond practice-area preferences. For some, large firms are the best choice—and the trend toward consolidation is a tremendous plus. “It has given students opportunities at firms with even bigger platforms and a broader range of clients,” Casaleggi said. 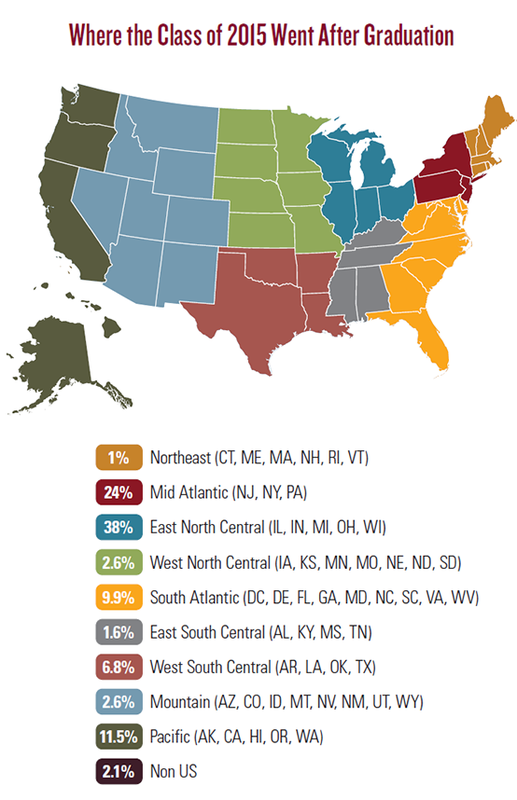 Another law firm trend that has benefited Law School graduates: the rise of elite boutiques. More students are looking at specialty firms and, although some only hire laterals, others are starting to recruit students, either at the entry level or once they have a completed a clerkship or two. The Law School now has about a half dozen boutiques who participate in On-Campus Interviewing, and it has a strong relationships with elite boutiques, such as Bartlit Beck Herman Palenchar & Scott (see story), that more often hire lawyers who have a couple of years of experience. Boutiques can be a great opportunity for students who know they are interested in a particular practice area—for instance, telecommunications law or high-stakes litigation, Casaleggi said. When Anthony-Ray Sepulveda, ’15, was choosing a law school, he already knew he wanted to pursue public service. And he chose the Law School because he knew that it provided the kind of support that would make that possible. “For me, Chicago was my dream school . . . but I knew I wanted to do public interest and, with that, there comes: what can I afford? I was looking at which schools provide access to jobs over the summer, particularly at places that don’t have the resources to pay their interns,” Sepulveda said. It has always been financially taxing to launch a career in public service, but the economic downturn created an additional pinch: these days, nonprofits often cannot afford to hire—and train—new lawyers right out of school or pay summer interns. Add the burden of student loan debt, and many graduates found it nearly impossible to gain the experience needed to land a job in the public sector. As part of this expansion, the Law School in 2012 launched the Postgraduate Public Interest Fellowship program, which now offers seven competitive fellowships to high-achieving students with a demonstrated interest in public service. Through the program, each fellow receives $50,000 in support to work at an eligible host agency for a year. A few years before that, in 2006–2007, the Heerey Foundation made a gift that allowed the Law School to offer $5,000 in summer funding to first- or second-year students pursuing a public service internship for at least eight weeks (see story). That, combined with the support of other donors, has enabled the Law School to guarantee summer public service funding for all first- and second-year students. For Sepulveda, a Heerey Fellowship after his first year made it possible for him to afford a summer internship at the US Attorney’s Office in Arizona. The Law School also offers the full-tuition Hormel Scholarship, which is granted to highly qualified students planning public interest careers; Public Service Initiative Fellowships, which provide one year of financial support to a limited number of graduating students who engage in full-time legal work at qualifying public service organizations; and loan repayment assistance. In addition, Career Services offers career counseling, networking, pro bono opportunities, and support for students pursuing entry-level federal government “Honors Program” hiring or for students developing outside fellowship applications, such as the Skadden, Equal Justice Works, and the Polikoff-Gautreaux. And once a year, the Law School sends about two dozen second- and third-year students to the Equal Justice Works Conference and Career Fair, where students interview with public interest employers and attend workshops on public interest careers. 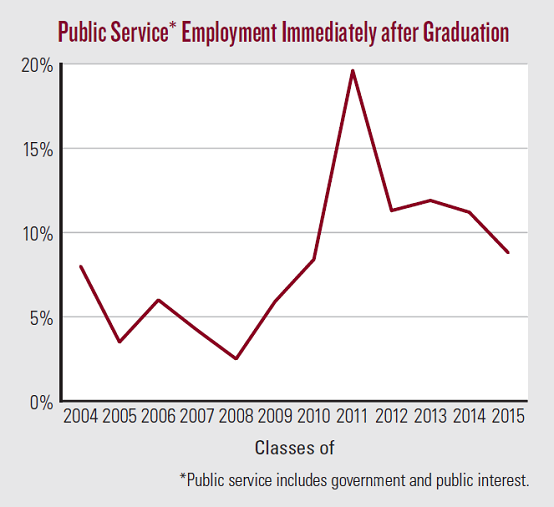 Exact numbers were not yet available when the Record went to press, but Curry said that the percentage of 2016 graduates pursuing public service work was set to hold steady or rise slightly. Graduates pursuing academia face their own hurdles, and the Law School has also increased support for students and alumni who choose that path, including faculty mentoring, workshops, and a law teaching conference at which aspiring academics present their scholarship in practice job talks. The Law School has been among the most successful producers of law teachers over the past couple of decades. According to a database kept by Career Services on behalf of a faculty committee on law teaching, there were nearly 500 alumni teaching at or emeritus at law schools. But academic hiring has changed in recent years, and these days few aspiring scholars enter the teaching market immediately after graduation. Instead, they gain experience in a clerkship, at a law firm or government agency, or in one of the non-tenure-track teaching positions that have become more common. Still, preparation often begins in Law School, and a faculty committee on law teaching—which is chaired by Brian Leiter, the Karl N. Llewellyn Professor of Jurisprudence, and includes Lisa Bernstein, the Wilson Dickinson Professor of Law, and Lee Fennell, the Max Pam Professor of Law—is available to offer guidance. Every year, that committee puts on an informational session for students, and a variety of materials written by Leiter are available on the website. Bernstein teaches a workshop that introduces students to legal scholarship; the goal is for each student to have a publishable paper by the end of the year. The Law School also offers a course aimed at aspiring academics, Canonical Ideas in Legal Thought, which was taught last year by Masur and Anup Malani, the Lee and Brena Freeman Professor of Law. The course, described as the equivalent of a research colloquium in a PhD program, focuses on influential legal scholarship. Faculty members also mentor alumni one-on-one and help them prepare to go on the teaching market. And each year, the Law School hosts a law teaching conference for Law School alumni who are going on the market that year. The conference includes an informational panel, mock interviews with faculty members, and a chance to deliver their job talk—important practice in a market that is more competitive than ever. Prompted by a rising demand for lawyers with corporate and financial savvy, the Doctoroff program, which launched in 2013, offers students the best of the MBA experience: an intensive core business curriculum, as well as a summer internship, enrichment opportunities, and the guidance of a one-on-one business mentor. Students must apply and be accepted into the program, which has served 38 students since it began. Participants say the program has given them a solid foundation of business knowledge, strengthened their ability to think about the law, and broadened their aspirations. Although the overall numbers are still small, in recent years the Law School has seen an increase in new graduates moving into management consulting, investment banking, and private wealth management firms. One thing has become clear in the years since the downturn: one size really doesn’t fit all, regardless of the market conditions—something that becomes clear when alumni return to the Law School. Their careers are diverse, and so are the routes they travel. Some remain at the same employer long-term—Adam Emmerich, ’85, describes his 30+-year career at Wachtell, Lipton, Rosen & Katz as “an incredible journey of both continuity and constant challenge and change”—and others switch career focus, moving among law firms, government service, corporate work, or public interest. Which underscores the point Willard has been making for years: it really is all about figuring out where you want to be—and the best time to start thinking that way is in school.